Daylilies and daffodils love full sunlight and gardeners are more than happy to oblige. These plants start emerging from the soil in early spring, and their multi-colored blooms are a sure sign that winter is over. Daffodils' native trumpet-shaped flowers offset the plant's green, sword-shaped foliage. Though often seen with yellow blossoms, they also have a wide range of yellow and cream-colored tones. From butter yellow to semi-orange, and from startling white to a creamy pastel, varieties abounding. Daylilies are no stranger to variety, either. White, purple, yellow, pink and orange, with many shades and hues in between, this easy-to-care for plants complement beds, animate border areas and prevent soil erosion on slopes. Some of the plant's petals are ruffled and frilled while others take on a classic, full petal shape. Daylilies have a variety of foliage shapes and tones. Some leaves are sword-shaped, while others take on a softer appearance still others feature evergreen foliage. These varieties maintain their green tones throughout the winter and are well-suited for cold climate gardens. They are adaptable to a wide range of soils and climates. They love full sun regardless of whether or temperature. Daffodils also revel in full sunlight. They thrive when planted near walkways where they receive both bright light and attention. Not all varieties look like. There are several different kinds of varieties each featuring distinctively shaped flowers. 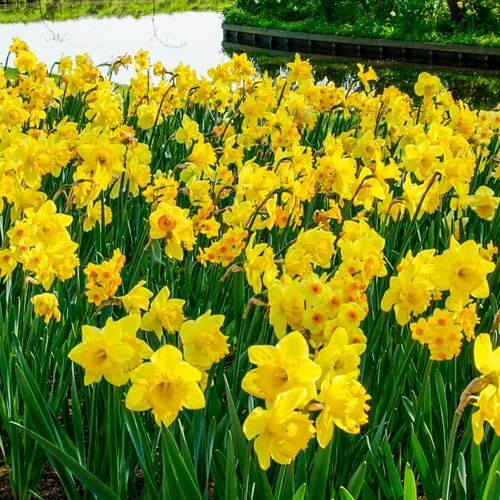 The trumpet shape is the classic daffodil flower, but other varieties produce small cupped flowers. Other variations include double clusters, bell-shaped, clusters and even some that are described as looking like a "badminton shuttlecock." Variety and sunshine aside, the most significant part of planting these sun-loving plants is how little care they need to bloom. After a long winter of shoveling snow, you can sit back and watch these plants pull themselves out of the soil and add color to your garden. The perennial plants return every spring without fail.